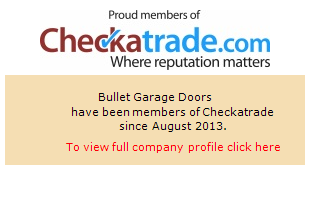 Here at Bullet Garage Doors, we are specialists in supplying and installing all kinds of garage door. Operating throughout Hemel Hempstead and the surrounding areas, we have a range of high-quality garage doors in a variety of styles, sizes, and colours; we’re extremely confident we’ll have something that suits your needs. Whether you’re looking for a traditional garage door, or want something a bit more modern, then get in touch. We’re more than happy to run you through your options. Automatic garage doors are becoming more and more common among homeowners in the UK. They offer a number of advantages, such as their remote access (handy when it’s raining) and their superior security potential. With well over fifteen years of experience to call upon, our team has seen all kinds of garage doors, and also has the ability to fit existing systems with an automatic upgrade. We don’t just supply and fit new garage doors. We also repair existing doors, if you’d prefer a slightly cheaper option (or simply remain fond of your existing garage door)! Keeping your garage door free of damage is extremely important, especially from a security perspective. Both the weather and unwanted visitors tend to make you pay if your garage door isn’t properly fitted and fully-functioning; garages are no longer just for cars, with a whole host of other options available in terms of what’s stored in them. It is absolutely essential that you get any repair work done swiftly and properly, and Bullet Doors can help you out in both respects. As a company we’re extremely well-respected throughout Hemel Hempstead and its neighbouring towns and villages. That reputation is reflected in both our Checkatrade profile and our testimonials, both of which we’d encourage you to take a look at. We’re based in Dunstable, meaning we’re just a short drive away along the M1. We’ve worked on a number of projects in the area, so if you ask around then you’ll almost certainly be able to hear about us from some other people, face to face. To get in touch with us, you can either call us on 01582 932 025, or fill out one of our online contact forms. Either way, you’ll hear back from us soon, and we’ll get to work on your project as soon as possible. Removed old door and frame and fitted new garador carlton in a brown powder coat finish. The matching steel frame was fitted behind the opening, and fitted with a new motor.